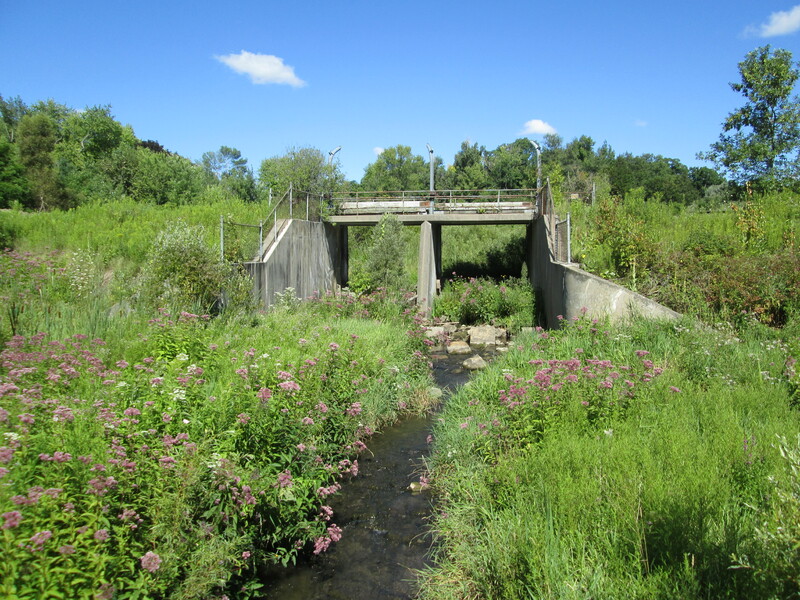 When millwright Ira White arrived at the north end of what would become Unionville in 1839 he recognized the east half of lot 13 in the 5th concession to be an ideal site to harness the water power of Bruce Creek. He built a sawmill first and then set about cutting the wood for the grist mill he built where the creek crosses Main Street in Unionville. This street was originally the winding lane to the mill but soon became lined with homes and businesses as the community grew around the mills. It is believed that White named his mills Union Mills when Upper and Lower Canada were united in 1841. When a name was needed for the post office Unionville was selected. An archive photo of the mill is seen in the cover picture. The area along the main street has now been declared as a cultural heritage district because of it’s unique collection of heritage buildings that demonstrate many architectural styles from log houses to condos. 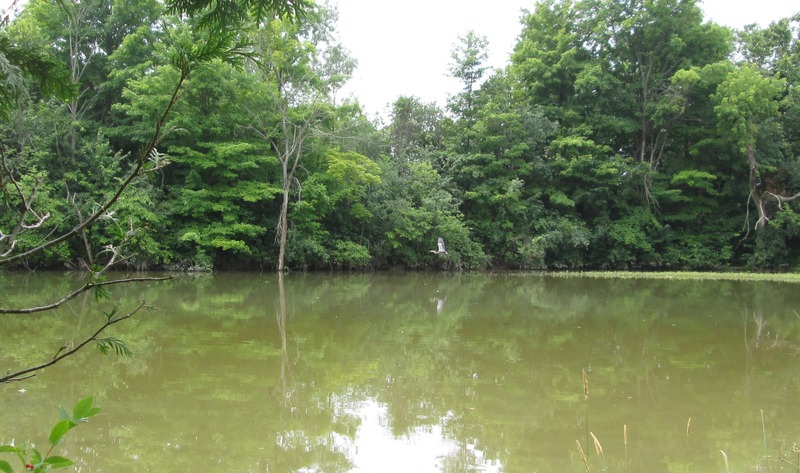 Toogood pond was named after Arthur Toogood who owned the property prior to the town of Markham buying it in 1980. We parked on Main Street in the public lot across the street from the original site of Union Mills and walked along Bruce Creek toward the dam. An early name for the mill pond was Willow Pond and the reason for this can still be seen today in the old willow trees that line the sides of Toogood Pond. On the east side of Toogood Pond is a pavilion with restrooms that are open and heated at this time of year. There is also a viewing deck and restaurant. This picture is taken from the fishing platform that is built out into the pond on the west shore. William Berczy led a group of about 67 families of Pennsylvanian German settlers into the woods north of Toronto and founded what would become Markham. They completed 15 miles of Yonge Street between Eglinton Avenue and Elgin Mills and one of his group was Philip Eckardt. Berczy Creek flows into Toogood Pond and is named after Berczy. The trail criss-crosses the creek several times before reaching 16th Avenue which runs along the south side of lot 16. One of the bridges across the creek can be seen in the picture below. 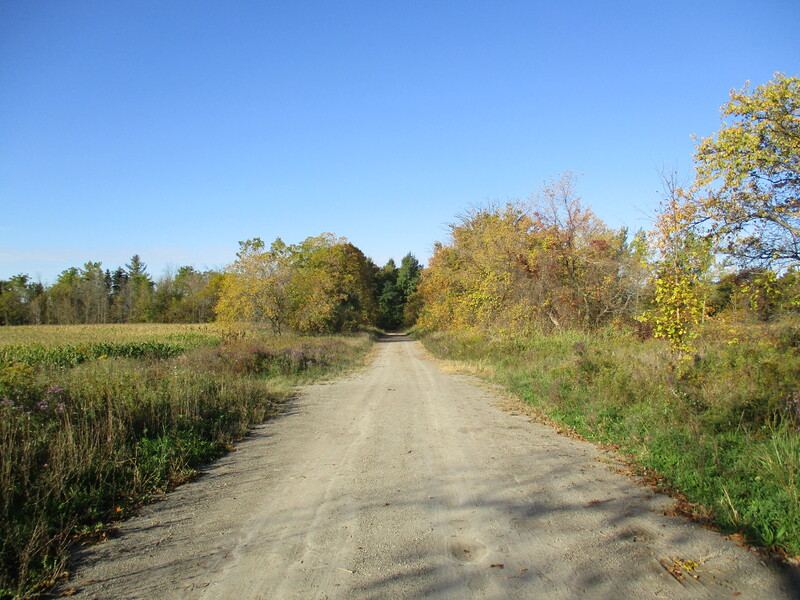 By walking east on 16th avenue for 1 kilometer you will come to Bruce Creek which leads back to the pond. A little side detour to Kennedy Road will bring you to a surprising log home and pioneer cemetery. The oldest surviving home in the community of Unionville is known as the Philip Eckardt Log House. Lot 17 in the 6th concession was first granted to Frederick Westphalen in 1794, when he arrived with Berczy, and he received his crown patent in 1803. In order to receive the full ownership of the property a settler had to complete some basic requirements including the clearing of 5 acres of land, the construction of a home at least sixteen by twenty feet and the opening of the road allowance along the property. Therefore, there was a log house on the property before Philip Echkardt arrived in 1808 and it is very likely that the home credited to him was already there when he purchased the lot. 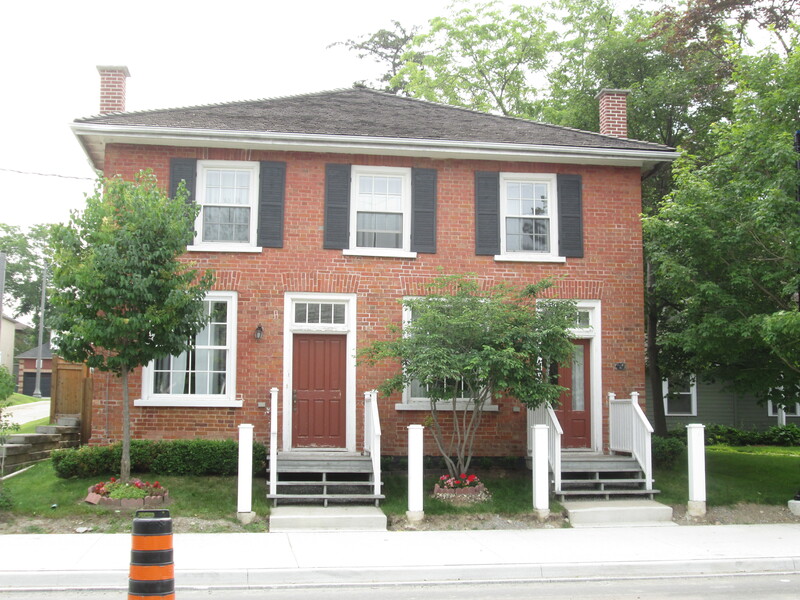 The house was used to host Lieutenant Governor Simcoe when he visited the area. It has been altered several times over it’s 200 year life and siding has been added over the original log construction. After following Bruce Creek south from 16th Avenue you return to the top of Toogood Pond. This pond has two creeks that flow into it and supports a large wetland. A long wooden boardwalk has been constructed that crosses both Berczy Creek and Bruce Creek. The original wooden crib dam at the bottom of the mill pond has been replaced with the modern concrete 5 sluice gate construction. 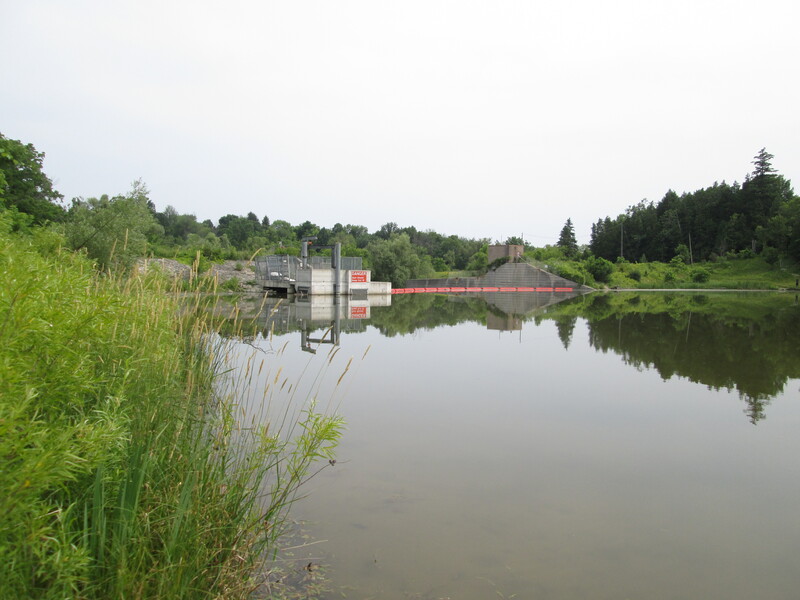 To allow the passage of fish around the Toogood Pond dam a fishway has been constructed. Fish can make their way up this little stream along the west side of the dam. At the top they have to make a small jump to get into the pond. One of the reasons for the unique style of the buildings in historic Unionville is the 140 years that the Planing Mill produced the wood and gingerbread for local tradesmen. 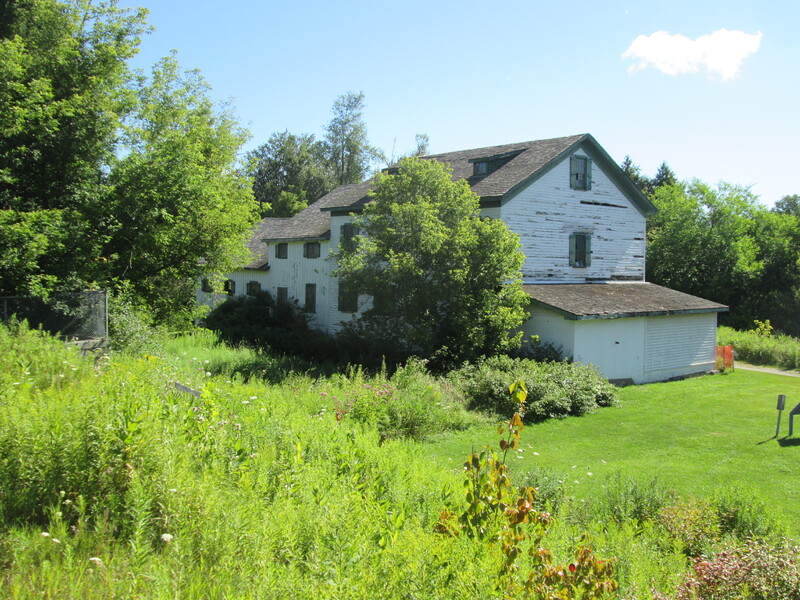 The original planing mill was built in 1840 by William Eaken and operated until severely damaged in 1978. The building was destroyed by a fire in 1983 but replaced with this modern structure in 1987. The Stiver Brothers grain mill is the last remaining one of its kind in Markham and a style of building more commonly seen along the railway lines in the prairies. Unionville was the centre of a rural farming community and around 1900 grain elevators began to appear beside the railway station. in 1916 Charles and Francis Stiver repaired a grain elevator beside the train station that had been damaged by fire. The Stiver Coal and Seed company was in the business both of buying and selling seeds. They provided seed for planting as well as animal feed. Originally the chopping work needed to make the animal feed was done at the Union Mills. When they were destroyed in a fire in 1934 the Stiver brothers added a feed mill to their operations. The Stiver Brothers closed the business in 1968 and by 1993 the building was empty and deteriorating. It has recently been restored and was opened again in 2014 as a cultural centre. John Noble Raymer came to Markham township in 1809 and his cheese factory is believed to be one of the first in Upper Canada. John operated a family farm but in 1866 he traveled to Evans Mill, New York to study the art of cheese making. When he returned he opened a cheese factory on the family farm. It was so successful that he decided to expand with a second factory in Unionville. He purchased a half acre property on the east side of main street just above the Union Mills. In 1870 he built and opened his cheese factory in Unionville. After he died of smallpox in 1874 the business carried on until 1878 when it was closed and the building sold. The front wing and porch were added when it was converted into a home. The Crown Inn is the oldest surviving inn in the community and it is also on the east side of Main Street just above the site of the Union Mills. It was built around 1860 by a man named William Size who lived with his parents in the Union House which was an inn across the street. He operated his hotel in direct competition with his parents. One of the first hotel keepers here was Avery Bishop whose great-grandson was Billy Bishop a World War One flying ace. The Toronto Island Airport is named after Billy Bishop. The Union Mills may be gone but the mill pond and historic community it spawned remain almost untouched by time. This entry was posted in Rouge River, Uncategorized and tagged Cultural Heritage District, Stiver Mill, Toogood Pond, Union Mills, Unionville on March 6, 2016 by hikingthegta. Passmore Avenue was never completed as a continuous road but today it has become even more fragmented. I set out on Sunday afternoon to hike through the sections which had once been opened and are now closed (marked in green on the map below). Passmore Avenue , also known as the 5th Concession, ran from The Scarborough – Pickering Townline to where the 404 now lies. Parts of it are still open under other names, including Gordon Baker Drive which lies on the old roadway. From Kennedy Road to Midland it still bears the name of Passmore Avenue. At Markham Road there are still sections running both east and west known as Passmore Avenue. Steeles Avenue runs across the top of the 1877 historical atlas pictured below. Passmore Avenue runs one lot below except where the line is dotted indicating that the road allowance was never opened. The Rouge River cuts through the centre of the map between lots 12 and 13 (numbered along the top). Between lots 10 and 11 runs Littles Road (yellow) which has also been recently closed. It is shown extending one lot beyond Passmore Avenue but the southern portion has been closed so long the farmer has taken it back as part of the field. The area east between here and the Rouge River is now Cedar Brae Golf and Country Club. This picture looks from the end of Littles Road along Passmore Avenue toward the golf course. In the field just before the golf club are the remains of a race track for horses. It was built in 1966 and within 20 years it was gone. From the ground little can be seen except the remains of the barn and the foundations of some out buildings. 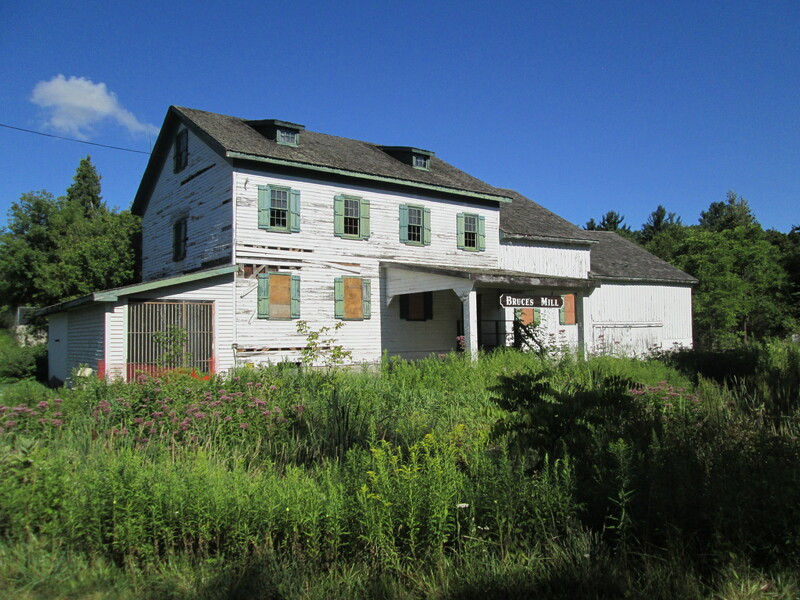 The last three structures on the property were removed in 2002. This picture is taken from standing on the racetrack looking north to where it curves left just before the trees at the horizon. The outline of the oval track is still clearly visible from Google Earth. Passmore Avenue used to run east from Littles road. On the county atlas there is a road which runs between lots 8 and 9 and divides John Sewells properties. Today we call this Sewells Road (orange) and where it crosses the Rouge River on the map is the site of Toronto’s only suspension bridge. The section of abandoned Passmore Avenue (green) between Littles and Sewells roads has become fully overgrown. It is little more than a strip of trees one chain wide (66 feet) along the end of the farmer’s field. I have walked through this section several times over the years and always find old pop bottles along here. Today I found a 1962 Pepsi bottle but the condition was poor and I already have a better example. Like all closed roads they seem to attract people with garbage. There are the parts of an old truck scattered along the old road allowance. The steering wheel is seen in the picture below. 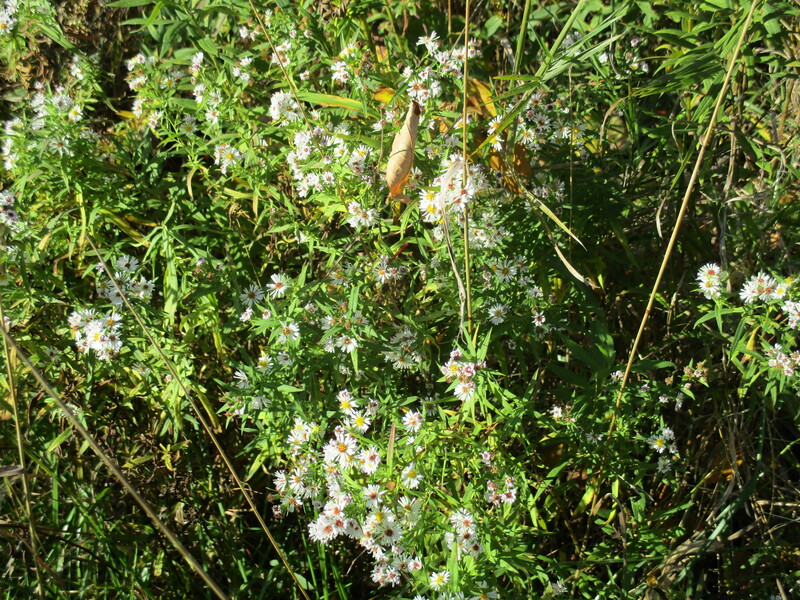 White asters bloom in places along the roadway. These examples are smaller in size than their purple cousins that are common at this time of year. 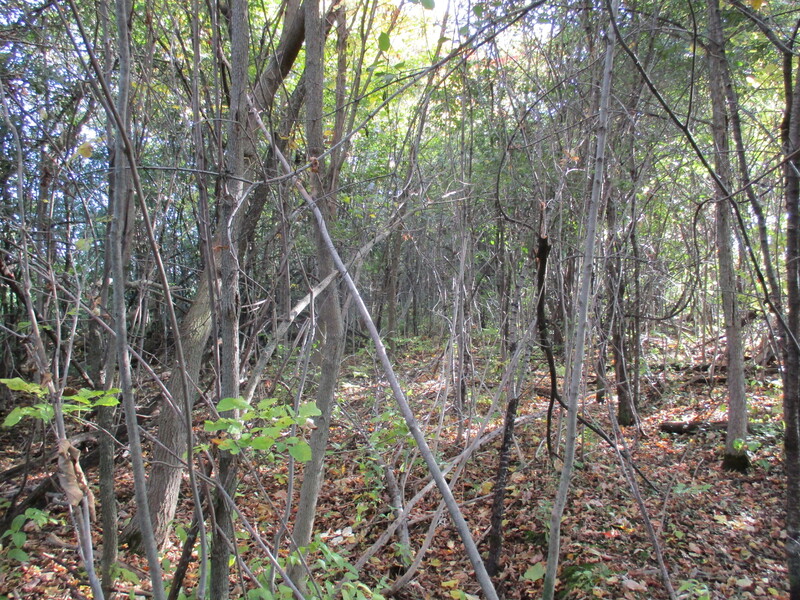 Motorists driving down Sewells Road would never see where Passmore Avenue emerges from the woods. Two large trees stand guard over either corner of the former roadway and it’s intersection with Sewells Road. The tree featured below is the southern of the two and has seen the transition from horses to model T’s and now to only the occasional hiker. The section of road along lots 7 and 8 was never opened but lot 7 was one of several owned by the Reesor family who lend their name to Reesor Road (pink). I returned to the car and moved it to Gordon Murison Lane (red) which runs between lots 4 and 5 and leads to William Murison’s farm on the county atlas. At the curve it joins Passmore Avenue and I parked where the maintained road ended. I spoke briefly with the people who live in the old Murison home and they feel that the old roadway is now private property but have not posted it as such. I walked from here through to the town line which is on the right side of the atlas pictured above. The road allowance from the Murison’s through to Beare Road (brown) is a regularly used trail with the eastern section servicing a few houses. The final section between Beare Road and Town Line (grey) is almost impassible. Dog Strangling Vine has taken over the most of the old road allowance. This invasive weed wasn’t here when I last hiked this section in 2011. I decided to make my way along the edge of the roadway because walking through the vines at this time of year helps spread the seeds. 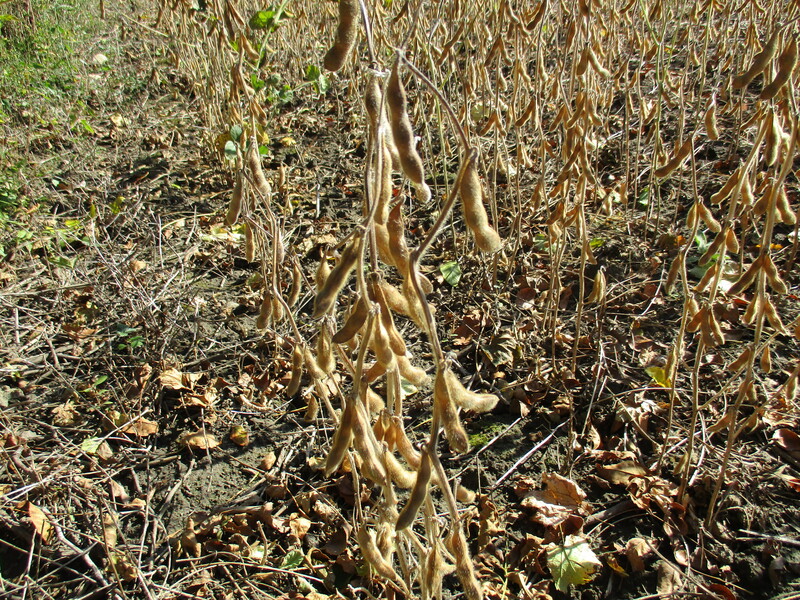 Soybeans are being grown in the adjacent field. Per acre, soybean produces more protein than most other land uses. Some studies suggest that men who eat a lot of soy products may have a lower sperm count and it is not recommended for those hoping to conceive. 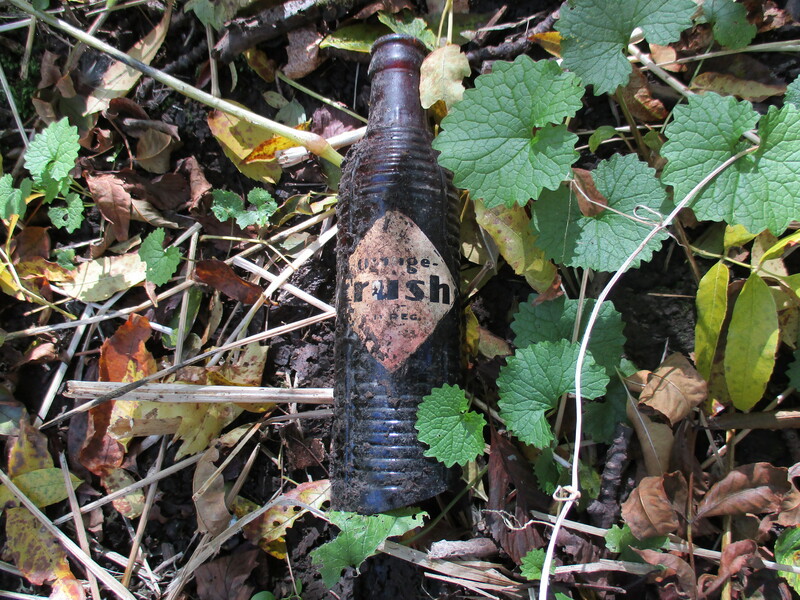 Orange Crush was sold in small brown bottles following World War two until 1958 when the new clear Marilyn Monroe bottles were introduced. These brown bottles were described as able to “protect the fresh fruit flavor from the harmful effects of light.” I found a bottle that was, unfortunately, missing the bottom. The applied colour label was badly faded on the side that was facing down (shown) and completely missing on the exposed side. 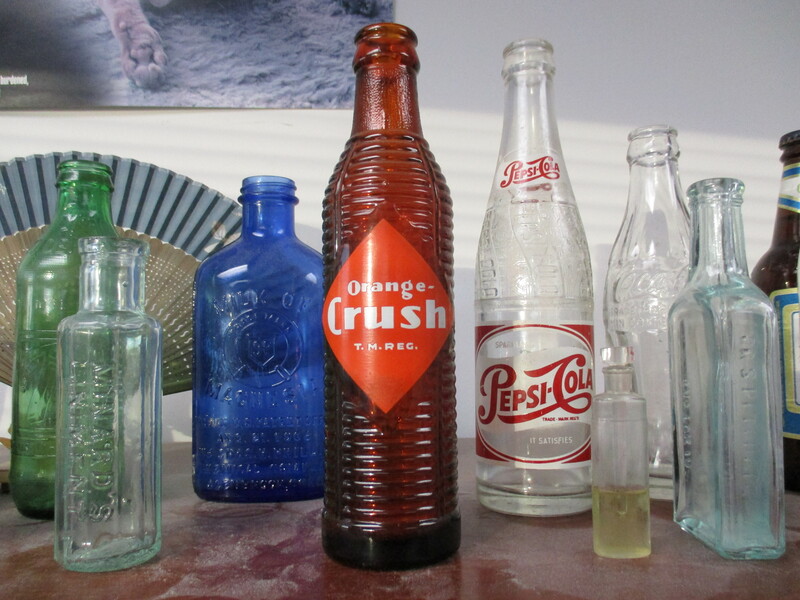 When it was new the Orange Crush bottle would have looked like the one I have on my desk at work. From left to right a 1970 no return 7-Up, 1860’s Minard’s Linament, 1906 Milk of Magnesia, 1949 Orange Crush, 1953 Pepsi, 1880’s perfume sampler, 1956 Coke, 1860’s Pitcher’s Castoria and a 1984 Labbatt Blue bottle complete this picture. A pair of abutments is all that remains where Passmore Avenue crossed Petticoat Creek. There isn’t much water in here at the moment but at times there must be a fair bit. The short span of the bridge can be seen in the cover photo. Passmore Avenue never ran the full length of Scarborough Township and several sections have since been closed. Those sections make for an interesting hike where I always see something new each time I explore. 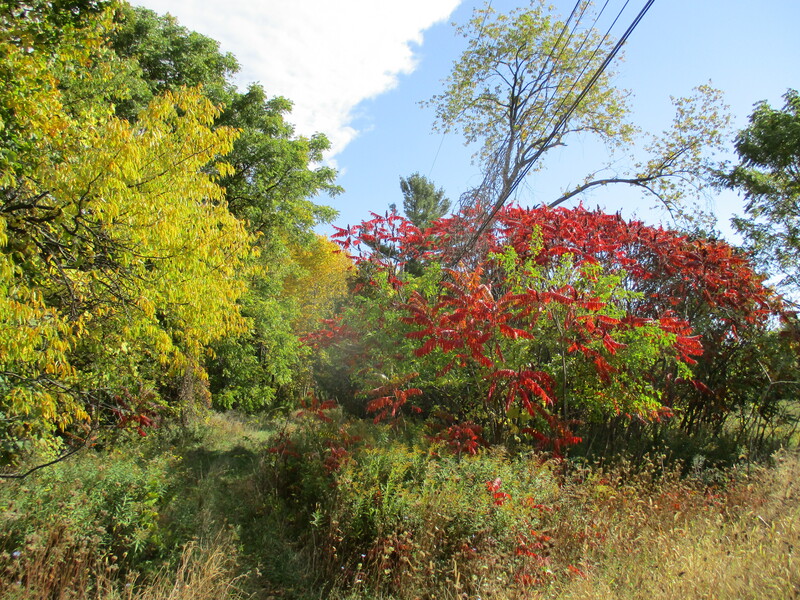 This entry was posted in Rouge River and tagged Cedar Brae Golf, Orange Crush, Passmore Road, Petticoat Creek, White Aster on October 14, 2015 by hikingthegta. It was one of those perfect summer afternoons. The skies were sunny and it was 21 degrees without humidity. 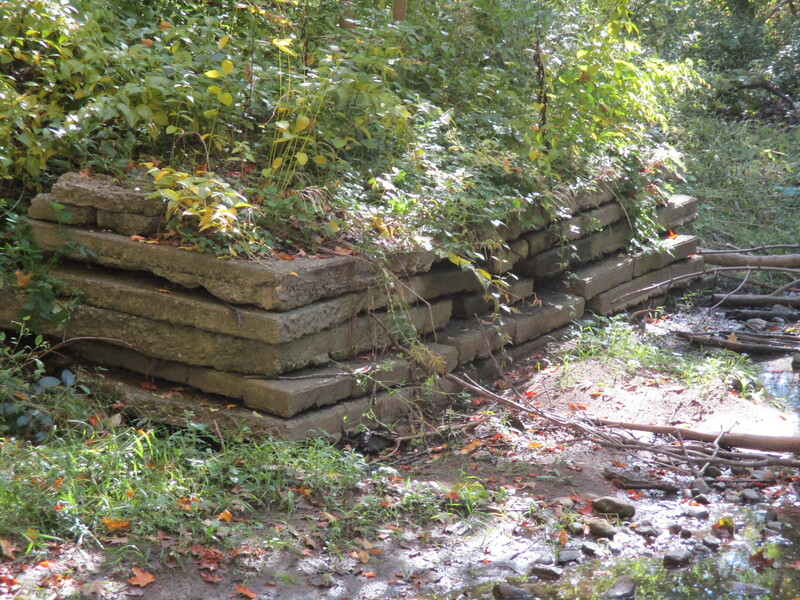 I decided to visit Bruce’s Mill Conservation Area to check out the remains of the 160 year old grist mill in the park. Situated in the headwaters for the Rouge River, Whitchurch Township became the home of many German settlers. In order to be able patent a land grant, and gain full rights of ownership, a settler had to meet certain requirements. They had to build a home of at least sixteen by twenty feet and occupy or rent it within three years. 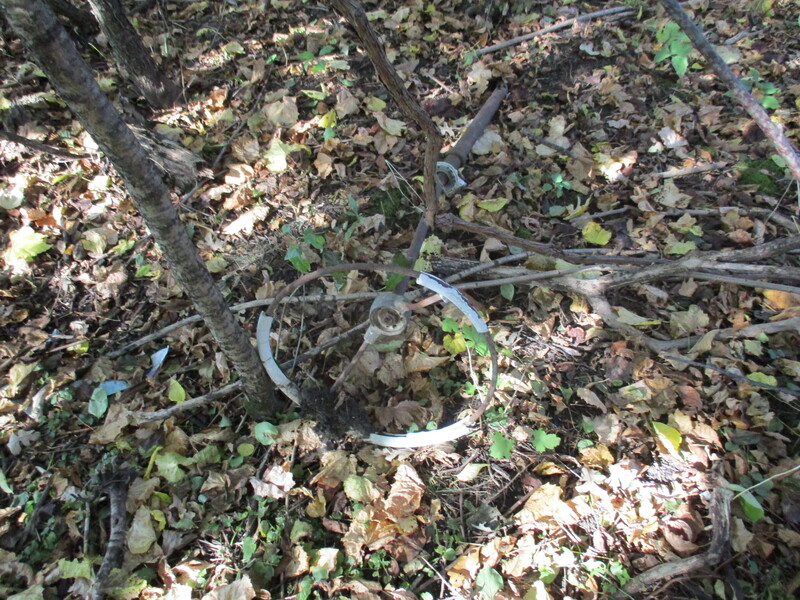 Five acres of land had to be cleared and surrounded by a fence. The road allowance along the property had to be cleared and maintained, free of stumps. After taking the oaths to the crown one would then own their land grant, usually 100 acres. 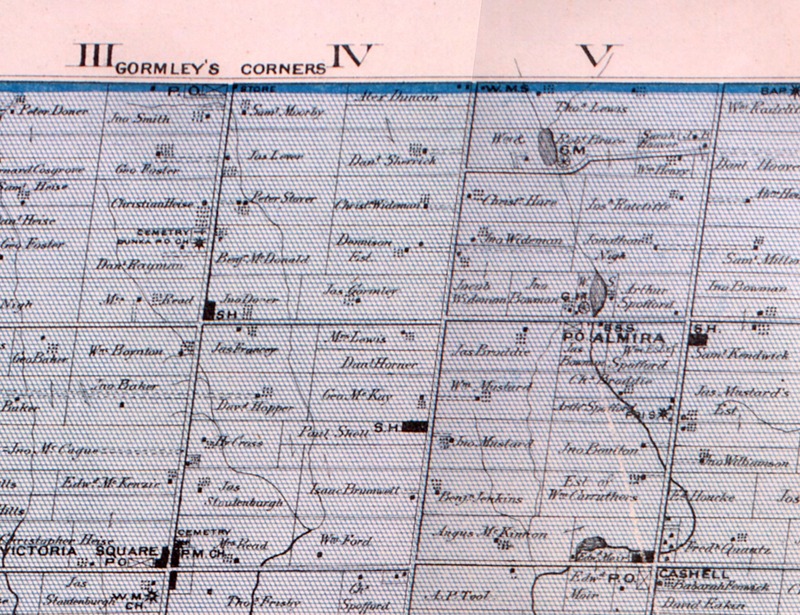 On the 1877 historical atlas map below the fifth concession is marked with “V” at the top of the page. Stouffville Road runs across the top of the map (under the blue line). 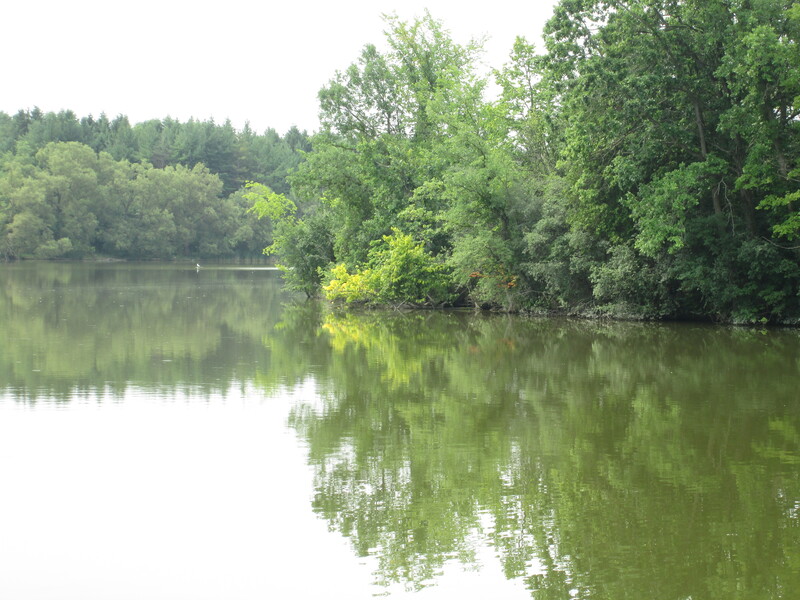 Thomas Lewis owned lot 35 and below that on lot 34 is a pond on property belonging to Robert Bruce. It is marked with a GM for Grist Mill and a water wheel symbol. This is the location of Bruce’s Mill. Casper Sherk built the first grist mill on this site in 1829 and he may have been the settler who first owned the land grant. On the map above a road has been built below the mill running between modern Warden and Kennedy Roads. This road is not part of the normal grid of the land survey and is therefore a “given road” built to allow customers access to the mill. Sherk built an earthern berm and a wooden dam to create the mill pond. The berm remains but the dam has been replaced sometime after 1900 with the modern concrete one with it’s dual sluice gates. In the picture below the grasses hide the berm which is equal in height to the concrete structure. In 1842 William and Robert Bruce bought the mill and some adjoining property and changed the name of the mill to Carrick Mills in honour of their home in Scotland. The sluice gates at the mill are still remarkably complete. Wooden slats remain in both sluice openings and extra’s are carefully stacked on top. Three hoists are standing on top as if waiting to lower the boards back in and stop the flow of water. In the past the mill pond was used for swimming and fishing but it is currently filling up with wetland plants, creating a bird and butterfly watcher’s paradise. The present mill, as seen below and in the cover photo, was built in 1858 using wood from the original mill in the storage area at the north end of the building. 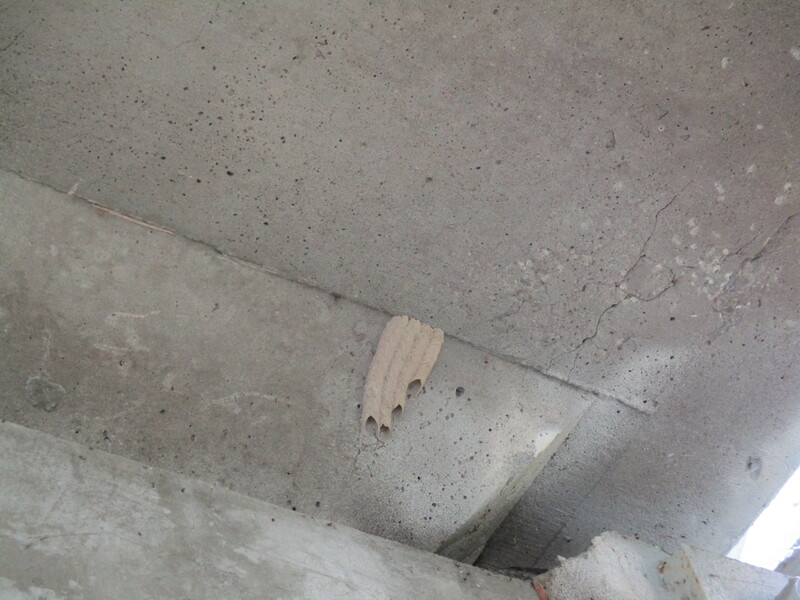 There are wooden boards on the ground under the front awning to cover a hole where grain was off loaded into the mill. A similar system was used at the Marchmont Grist Mill. The Bruce’s built a two and a half story mill of wood construction on a stone foundation. Glass was expensive and larger pieces were easily broken so smaller panes were typically used. This mill has two sets of 3 over 3 windows in each opening. The wire mesh on the right hand side in the picture below protects the water wheel and the tail race from intruders. 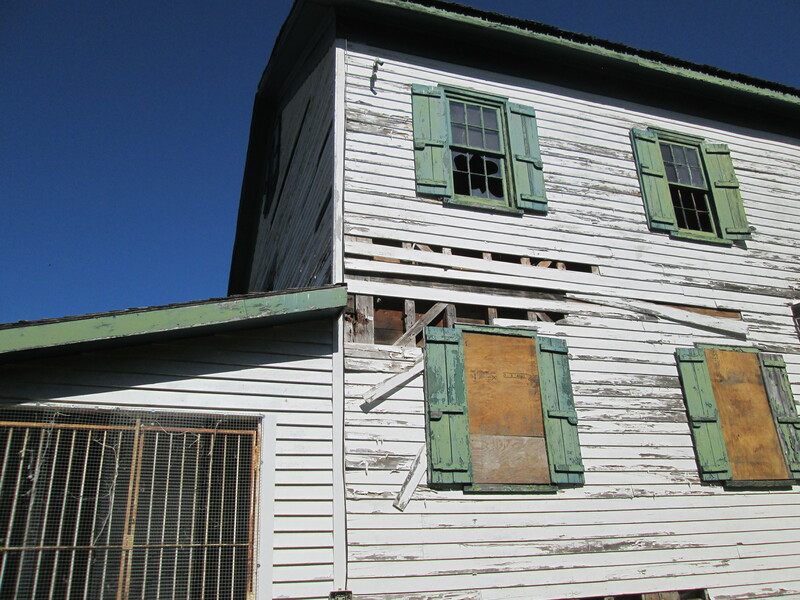 The mill is in a state of disrepair as boards drop off of the sides and windows are broken. A hole in the roof is letting water into the building. Initially water was brought from the mill pond to power the water wheel by means of a wooden flume. Later this was replaced with a penstock or round metal pipe. The concrete structure in the picture below supported the penstock as it came out of the mill pond. Bruce’s mill has a twelve foot diameter steel water wheel. Most water wheels were made of wood and were perhaps 40 inches rather than the nine foot wide Fitz Overshoot Waterwheel installed at the mill. 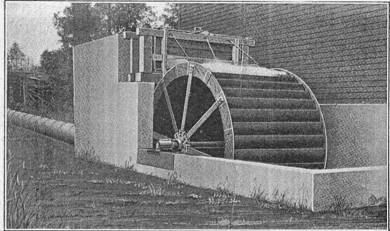 Samuel Fitz began building waterwheels in Hanover Pennsylvania in 1840. In 1852 they began construction of steel waterwheels which became the mainstay of their business. Steel wheels last much longer than wooden ones and can be used in the winter when ice clings to the porous wood making a wooden wheel inoperable. 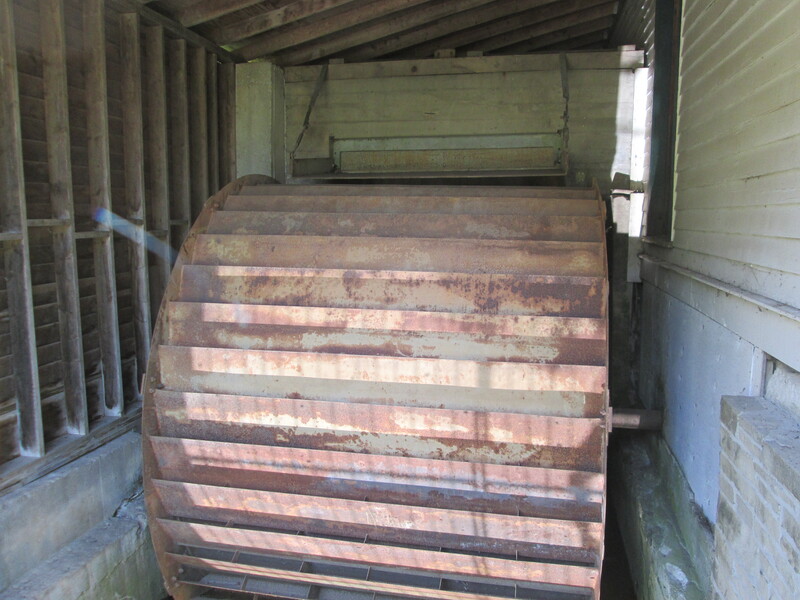 In their online marketing materials the Fitz Waterwheel Co. presents a picture of the waterwheel at Bruce’s Mills. The external building that now houses the waterwheel had not been added at that time. Also, notice the penstock running along the ground where it is bringing water from the mill pond to the wheel. The Toronto Region Conservation Authority bought the property in 1961 and the mill was closed in 1962. Bruce’s Mill was one of the last operating mills in Ontario to close. 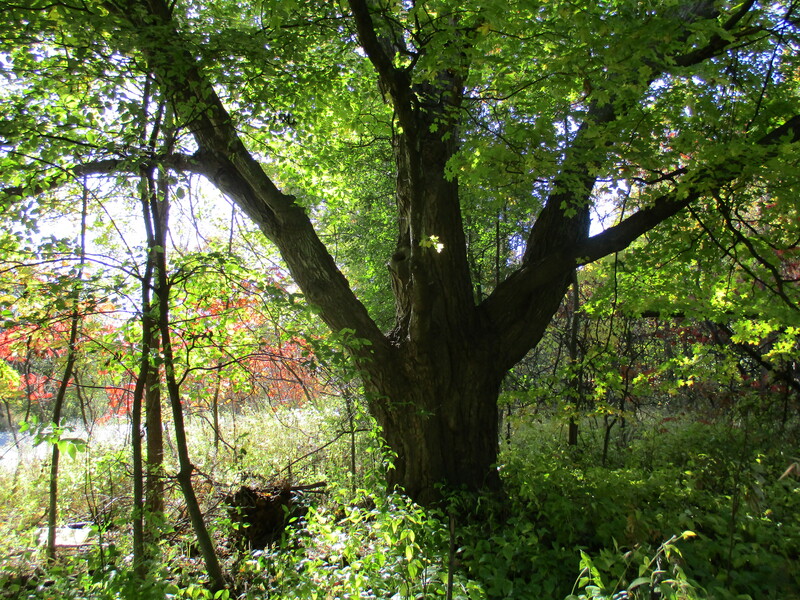 The TRCA has operated the site as Bruce’s Mill Conservation Area since 1965. 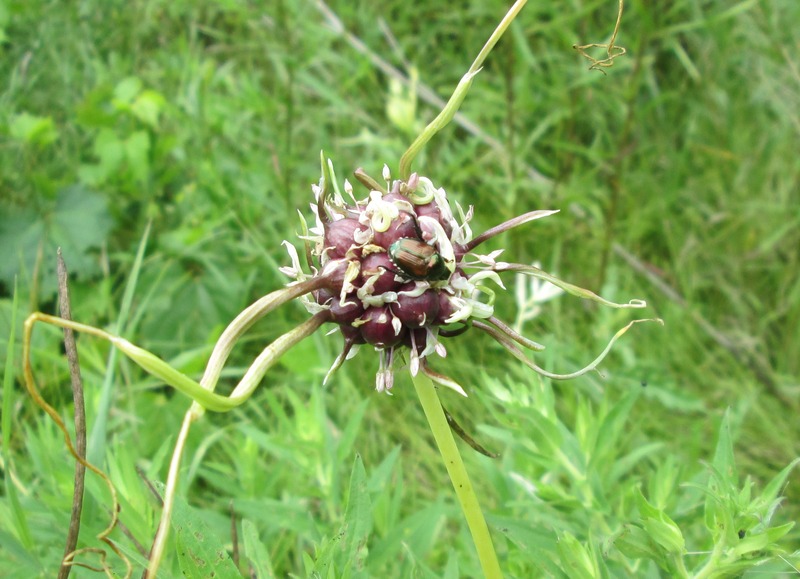 Walking garlic, also known as crow garlic or stag garlic, is not native to North America. 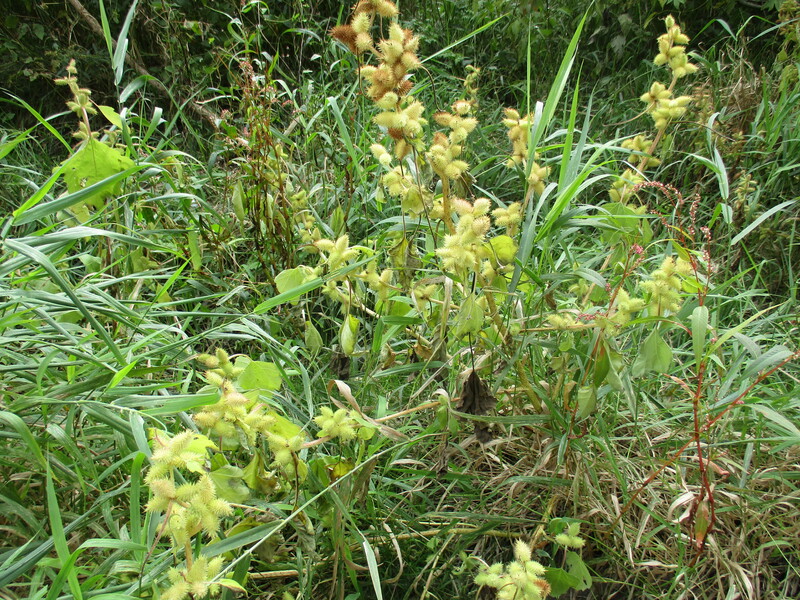 Farmers consider it to be a noxious weed because cows that graze on it can have a garlic odour to their beef and dairy products. It has a sharp aftertaste not present with cultivated garlic. Treetop Trekking is a new sport that is increasing in popularity. In 2002 the first park in Canada was established in Rawdon Quebec. With four parks in Quebec the company expanded into Ontario where it now has four additional parks. 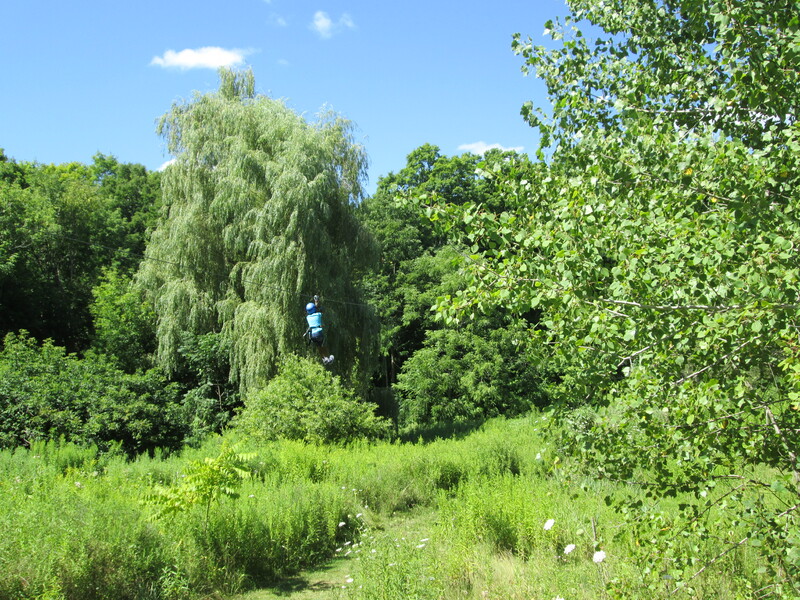 The park in Bruce’s Mills Conservation Area opened in 2013 and contains a 700 foot zip line. In the picture below a person in blue can be seen near the centre of the picture zipping above the butterfly gardens on the aptly named Monarch Zipline. A look at the rear of Bruce’s mill as it slowly falls apart. It would be a grand place to restore and use for weddings and other functions. Check out the most popular hikes in this special feature. This entry was posted in Rouge River and tagged Bruce's Mills Conservation Area, Fitz Waterwheel Company, Treetop Trekking, Wild Garlic on August 11, 2015 by hikingthegta. It was 25 degrees and partly cloudy. 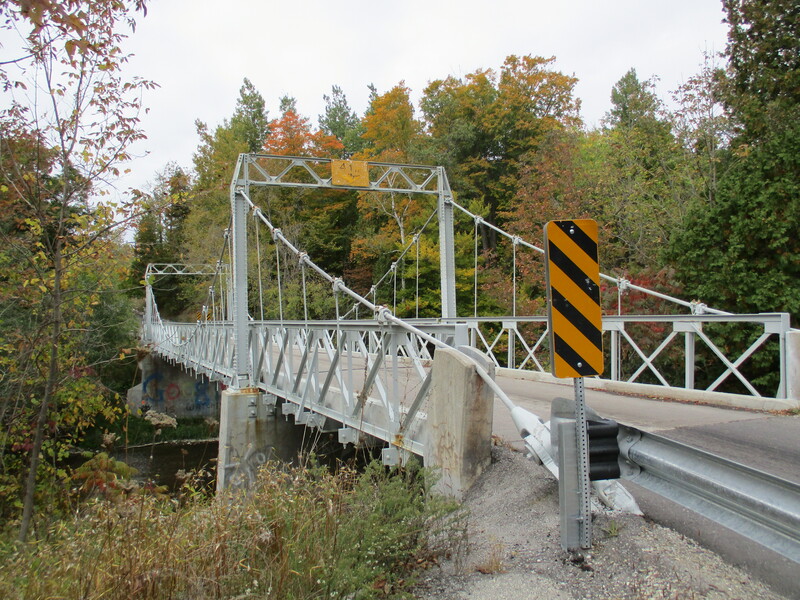 Having hiked small portions of the Rouge River in the past I decided it was time to feature some part of it in a blog. 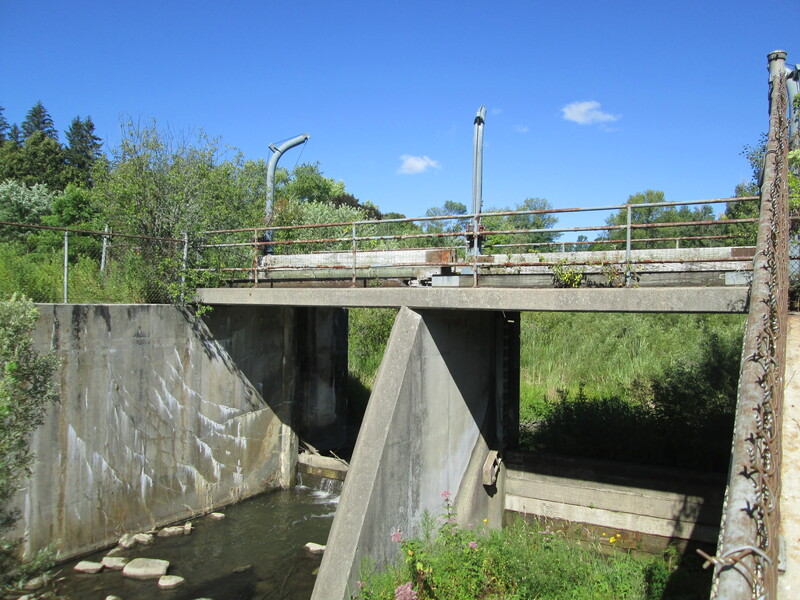 I drove to the founding place for the town of Markham to investigate the Milne Dam. I parked just off of Highway 7 near Milne Lane, a lane way that once led to the Milne property and dam. William Berczy was born in 1744 and came to Upper Canada with Lieutenant Governor John Graves Simcoe and basically co-founded York (Toronto). With a group of German settlers he cleared part of the town site for York as well as building a powder magazine for the Queens Rangers to help protect the town. His men then cleared Yonge Street from Eglinton to Elgin Mills, a span of 15 miles. With 64 families Berczy then settled in Markham Township in an area which came to be known as German Mills. The settlement didn’t thrive but Berczy did and his son Charles became Toronto’s first postmaster. 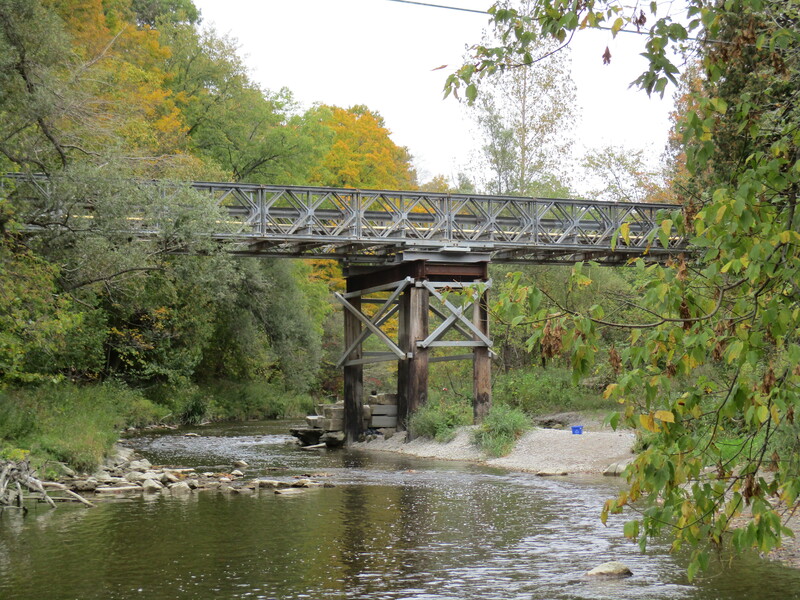 Alexander and Peter Milne built a dam and a mill on The Rouge River in the 1820’s. The business prospered and soon there was a woolen mill, fueling mill, ashery and general store. Soon a community named Markham was growing along Markham road to the north of the mills. The Milnes were also responsible for building mills in the area of Edwards Gardens and in Milne Hollow. 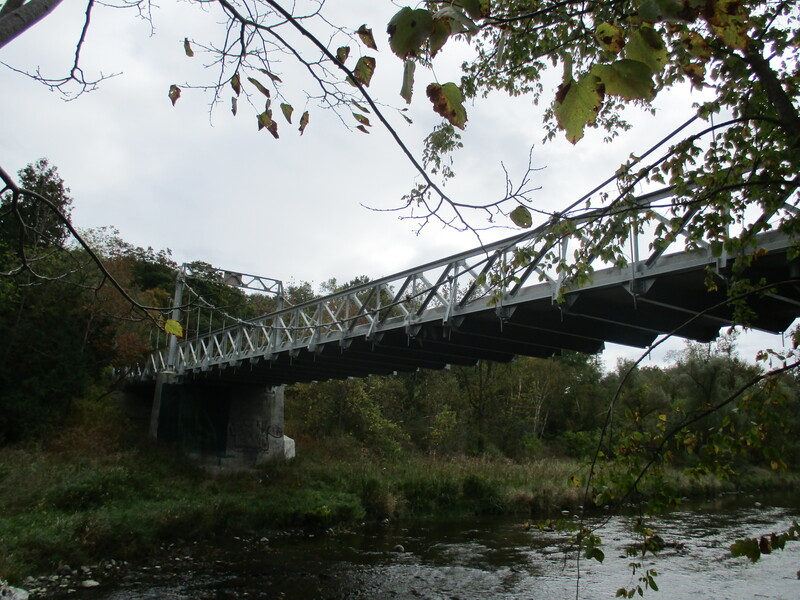 In 1911 Archie Milne, grandson of Peter, built the first concrete arc dam in Canada. It was washed out in a flood in 1929 but replaced right away. When it was washed out in the flood of Hurricane Hazel in 1954 it wasn’t replaced. 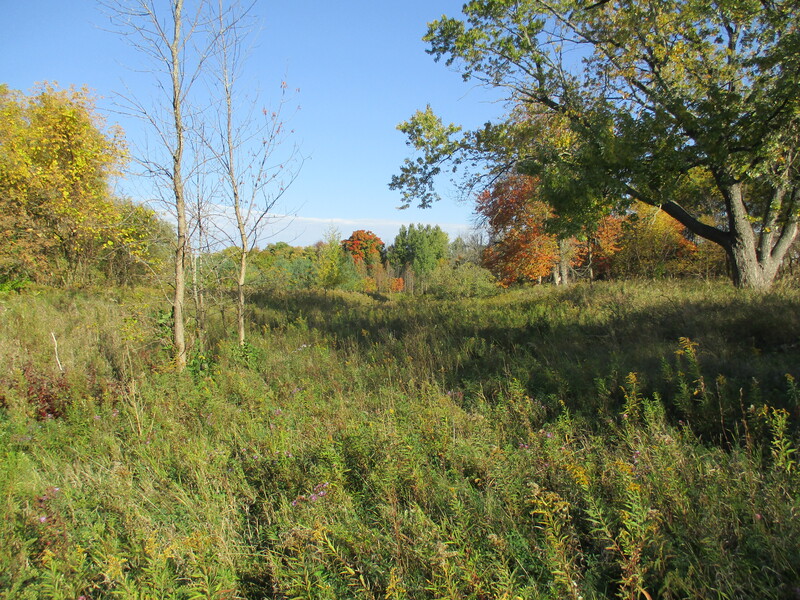 The Toronto Region conservation Authority bought the property in the 1950’s when they began to acquire the lands in the city’s floodplains. They replaced the dam in 1973 as part of a master flood control plan and created Milne Dam Conservation Area. The cover photo shows the side view of the dam where the water falls over the rim and onto the diversion weir at the bottom. From there it flows to another small dam before being released through a spillway into the open river again. The picture below is from down stream looking back up at the ten foot dam. The Milne Fishway can be seen at water level on the right. 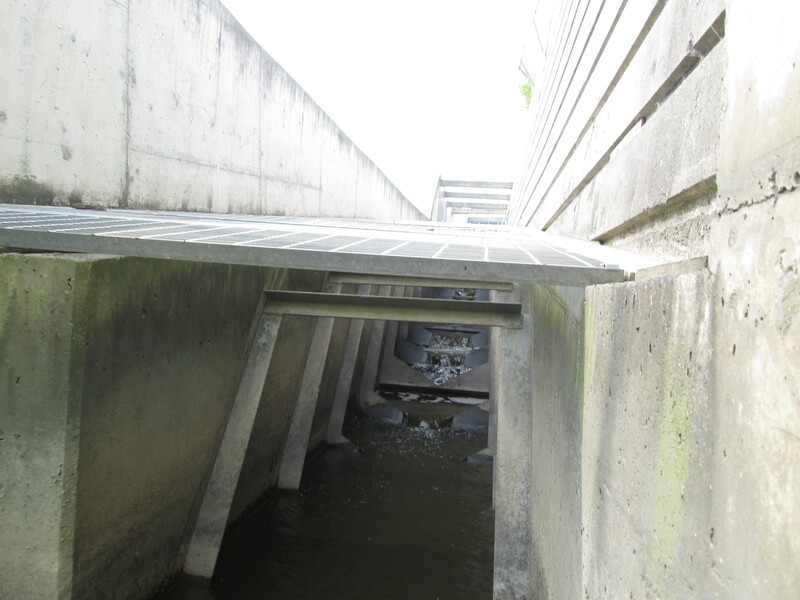 The photo below shows the view up into the fish ladder. The Milne fishway was constructed in 2001 and opened in 2005 at a cost of over $1 million. 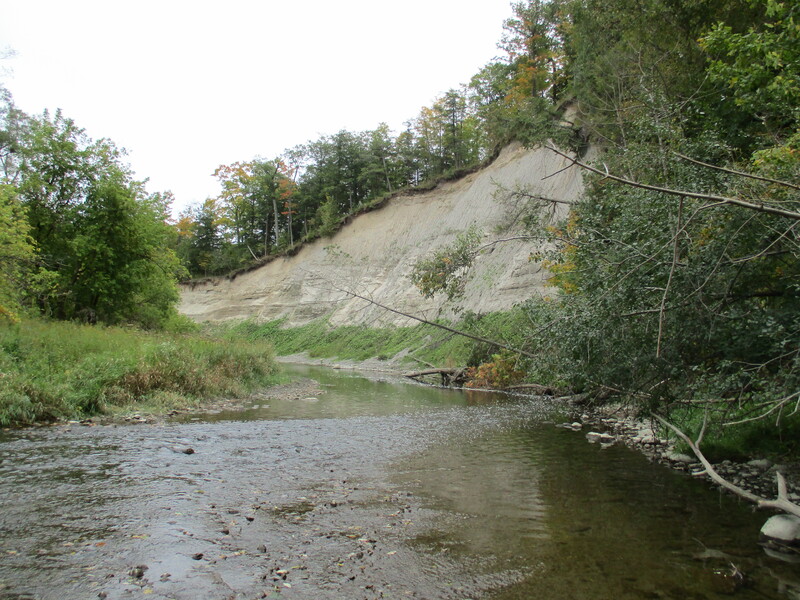 Prior to that, the dam had presented a migration obstacle for fish but now another 45 km of the Rouge River was opened to migration. 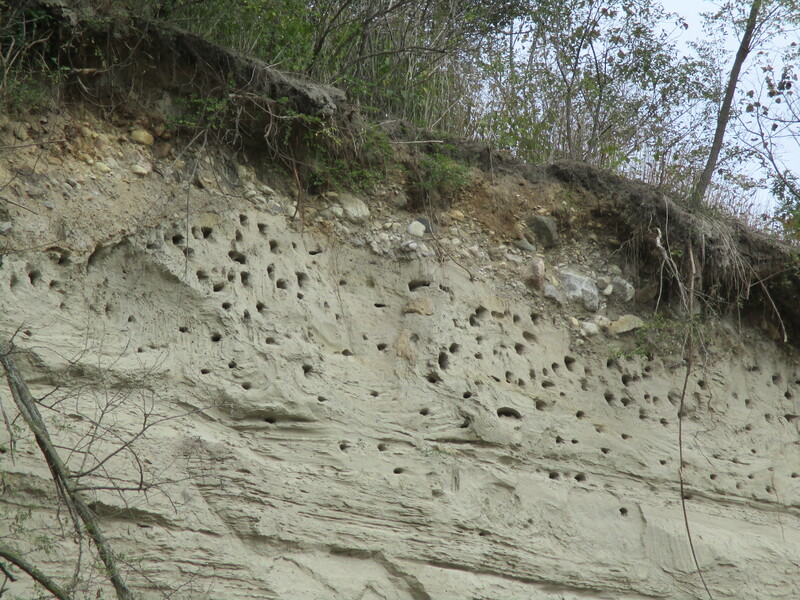 Records show that Rainbow Trout, Brown Trout, Smallmouth Bass and 10 other species have used the ladder to reach upstream. During periods of migration, such as spring time, a cage is placed on the top end of the fishway. This allows the removal of undesirable species such as sea lampreys. Sea lampreys attach themselves to fish with a suction cup-like mouth and feed on them until they die. 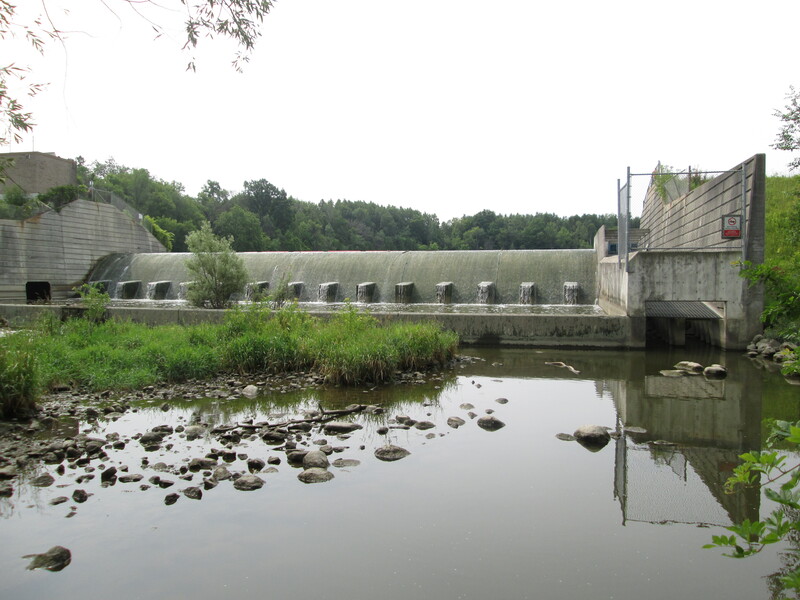 The Milne dam is the final barrier to lampreys to keep them out of the upper Rouge River. The Toronto region has been subject to flooding from the earliest days of it’s founding. The first written records of floods start in 1797. The first major destruction was caused by 5 inches of rain that fell in 24 hours in 1878 and washed out mills, bridges and dams. Other floods happened over the next 66 years until 1954 when Hurricane Hazel hit. With a death toll of 81 people it was time to get serious about flood control. 15 dams and flood control ponds were planned of which only three were built so far. Claireville dam in 1964, G. Ross Lord dam in 1973 and Milne Dam in 1973. The view below is from above the dam looking out across the smooth surface of the Milne Reservior behind the dam. The orange floats collect debris and prevent it from going over the dam. These mushrooms look like Fly Agaric which is a psychoactive drug capable of producing hallucinations. 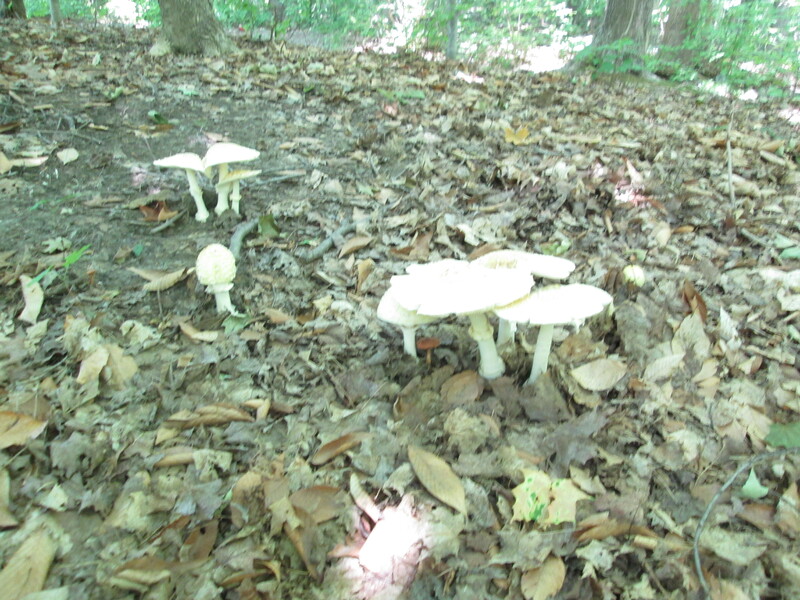 It actually more closely resembles Amanita Crenulata, of the same family, which is highly poisonous. The ring around the stipe tends to be a single fuzzy ring rather than several concentric rings. 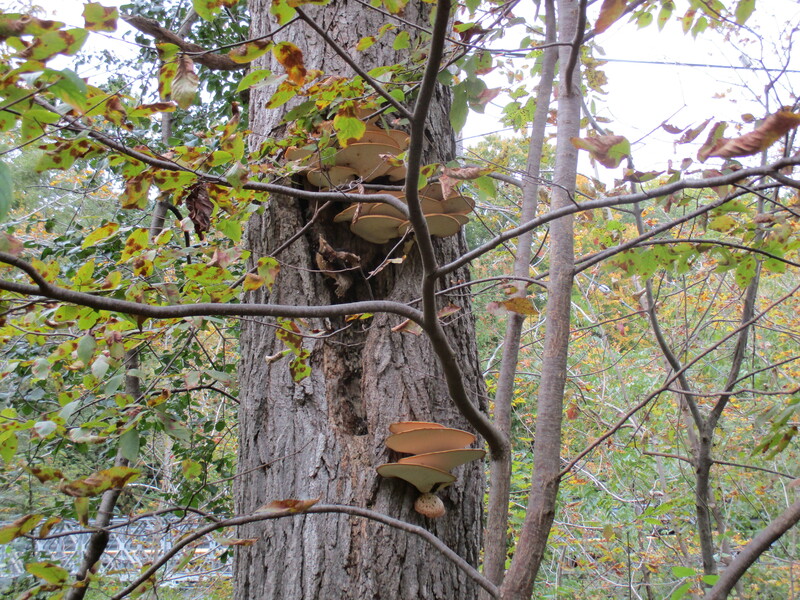 These mushrooms are the type that are typically shown, although most often red, in pictures featuring elves and fairies. In a strange twist, children’s books are filled with pictures of poisonous or hallucinogenic mushrooms. There are some real quiet places along the side of the reservoir where you can sit and watch the fish jump in the air. As I sat on a log, and roasted in the heat, the yellow tree branch hanging over the water reminded me to enjoy summer while its here because its over far too soon. With lots of wetlands and woodlands the park is home to a wide variety of wildlife. It’s excellent for migratory birds and I caught a great blue heron in flight along the far shore in the picture below. 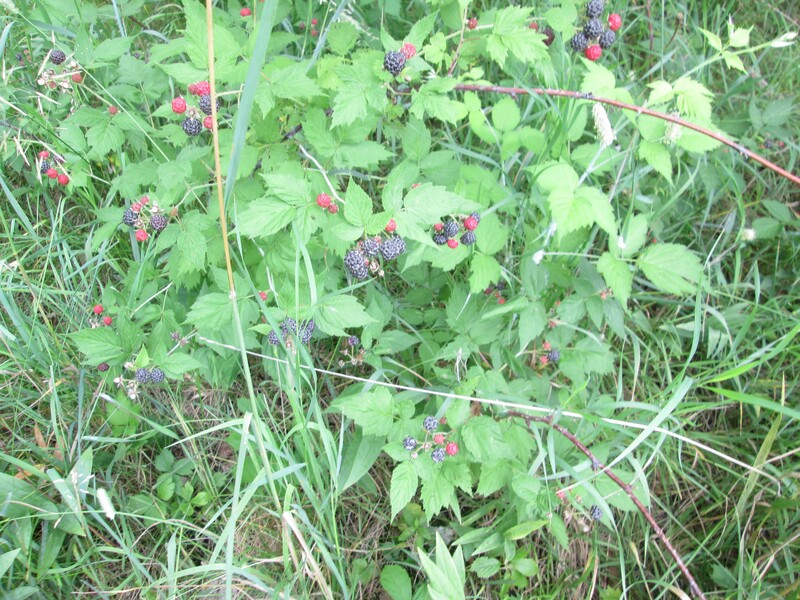 The black raspberry has a distinct taste from it’s red cousin but they were juicy and plentiful. Not to mention how good they taste when put on top of rich french vanilla ice cream. Where the Rouge River crosses under Markham road stands one of the early businesses in Markham. Archibald Barker bought this piece of property in 1844 and took out a mortgage in 1852 which likely indicates the date the house was built. The building was constructed to house a store on the south half and the Barker residence on the north half. Aside from running the store, Barker was a notary public and ran the Rouge Mills. This building stood near the mill complex and may have provided a place for workers to purchase supplies. Markham has plenty of history waiting to be investigated in future posts but the Milne Dam Conservation Area is a great place to visit and as I only hiked around one corner of the 305 acre park I’m certain to be back. 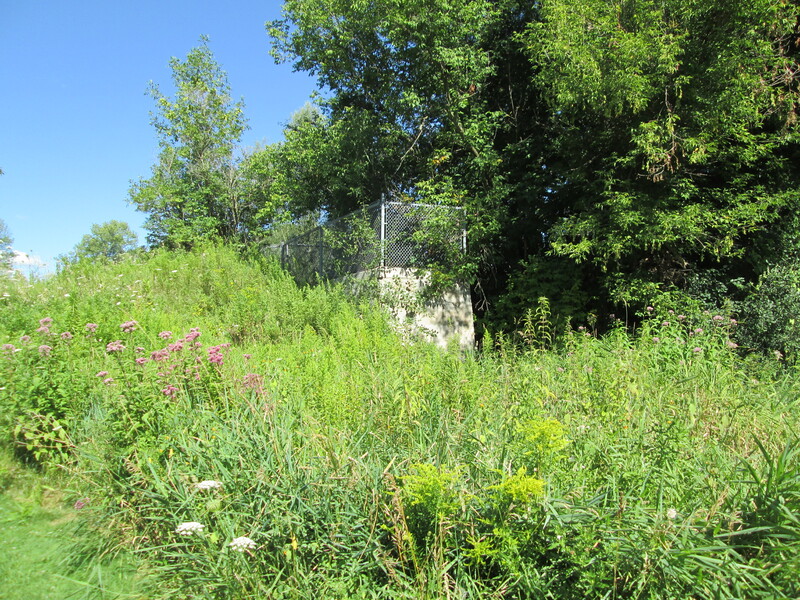 This entry was posted in Rouge River and tagged Black Raspberry, Fishway, lamprey, Milne Dam, Milne Dam Conservation, Rouge Mill on July 15, 2015 by hikingthegta.